"They had many other options. 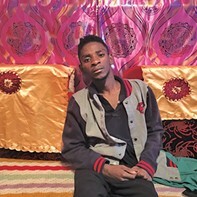 They had tasers, batons; they could have used other results instead of shooting a 17-year-old kid with a broomstick," Mohamed told City Weekly in May. It took just 42 seconds, according to recently released police body-camera footage, between two officers exiting the downtown Salt Lake City homeless shelter on Rio Grande Street and shooting juvenile Abdullahi "Abdi" Mohamed four times. Whatever else the footage shows about the events of that Feb. 27, 2016, night depends on who you ask. It was released by the Salt Lake County District Attorney's Office to the media on Jan. 21, 2017, moments after prosecutors showed it to a juvenile court judge as part of a hearing on charges of robbery and possession against the seriously wounded Mohamed. The footage and Mohamed's case have both become local watersheds on the state use of violence against people of color and the rights of juveniles in court. "To me, it's pretty damning," Utah Against Police Brutality's Jacob Jensen says. "A lot of people would agree it was way too quick, there were no efforts on deescalation and they left him to bleed out." Veteran officer Ian Adams, speaking as executive director of the Utah lodge of the Fraternal Order of Police, takes the opposite view. The footage is a textbook case of a good shoot, he says. "The thing that struck me was how by-the-book it was." Surveillance footage also released by the DA appears to show Mohamed hitting a man with a stick. The body camera video shows the two officers running across the road, repeatedly shouting at two men to drop the stick-like implements they are holding as they advance on a third retreating man. One officer identifies himself once as police. The second would-be assailant realizes the cops are there and peels away. Mohamed continues to steadily advance on the retreating man, with a long, thin, seemingly curved object in one hand. Adams points out that in the few seconds that the officers had before they believed Mohamed was about to strike—his weapon was later revealed to be a hollow, green metal broomstick handle—he did not respond to Officer Jordan Winegar and Officer Kory Checketts' repeated shouted commands to stop. "He's within striking distance of that victim; he's close enough, if he swings at that guy's head, officers aren't going to be able to react quick enough to stop him. And I'm not sure why a victim's life should matter less than the attacker's," Adams says. UAPB's Ian Oliveira argues that Mohamed posed no threat. 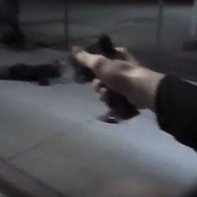 At the point where the two officers decided to shoot, they were close enough, he says, that "they could have closed in and physically removed the object before Abdi was able to make any decisive action." In August 2016, the city's Civilian Review Board found the shoot was "not within" policy because of the slow, non-urgent pace both Mohamed and the man he was pursuing maintained. Jensen agrees with the CRB's ruling. "I didn't see that in the video, that he was weighing up to hit him again," he says. "To me, that didn't ring true." Adams expresses disappointment that the CRB formed "asinine opinions" based on the lack of Hollywood-like violence they saw in the footage. "That's real life; not everybody's a screaming lunatic as they are about to kill somebody." For United Front Party's Lex Scott, the footage confirms what the vocal activist already knew—namely the need to train officers in deescalation. "There's a million different scenarios where a 17-year-old didn't end up in a wheelchair for the rest of his life. It's ridiculous." She argues the officers "could have used pepper spray, used a taser, tried calming techniques." Adams isn't surprised the officers didn't employ tasers. Mohamed presented a side-profile making it harder to hit him with the two prongs of a taser and the stun-devices have a reputation as being inconsistent in their effectiveness. "In a situation like that, where somebody is about to get injured or killed, you don't bring a less than reliable tool to that fight," he says. While much of the focus was on the shooting, critics also lambasted the police department for not providing medical care for Mohamed afterward. In the footage, three bystanders approach Mohamed, one kneeling beside him. Checketts repeatedly warns them to get back, his gun in hand. "We've got to get people back so we can get him medical," he says on the footage. An officer puts Mohamed into "the recovery position," rolling him over onto his side so he doesn't choke on his own blood. UAPB's Oliveira says law enforcement typically secures the scene prior to administering first aid. "However, some six or seven minutes in Winegard's footage, specifically, you see dozens of cops get into the area, make a perimeter, the crowd is nowhere at that point." Officers, he notes, were debriefing, chatting with each other while Mohamed lies bleeding on the sidewalk. SLCPD's Sgt. Brandon Shearer says, "Medical and paramedics were called for less than a minute after the shooting." The ambulance arrived within six minutes, but "medical people didn't feel safe to go in," he says, because of the crowd's anger. Scott says that's "a cop-out. Anyone who's ever taken CPR, you know to apply pressure to where the blood is coming out, you know how to do chest impressions." 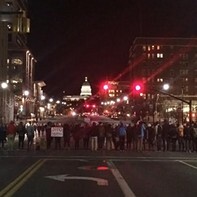 Blaming the crowd "has the implication that every homeless person is a criminal," rather than people "who had just watched their friend shot multiple times in the back." The Salt Lake County District Attorney Sim Gill's decision to show the footage in juvenile court followed a high-profile fight between the ACLU, activists and the DA's office over releasing the bodycam footage. The move came just two weeks after Gill "vowed to appeal a unanimous ruling from the State Records Committee" that it should be made public, the ACLU notes in a press release. Body cameras capture evidence that is "essential to the prosecution," Gill writes in an email. "If it is classified as evidence, then I have to treat it as such, taking all the necessary precautions. Or are we saying in the alternative that our desire to see [it] supersedes an accused [person's] right to a fair process?" 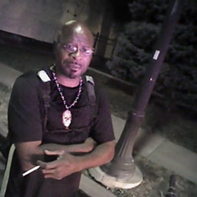 On Monday, Mayor Jackie Biskupski issued a draft policy mandating the prompt release of bodycam footage, and requested citizen input over a 30-day period in an attempt to forge a balance between community and law enforcement interests. Questions surrounding Mohamed's case first emerged a few days after the shooting when the Administration of the Courts (AOC) released his "delinquency record" to The Salt Lake Tribune, without first consulting the prosecution, the defense or the judge in the case. 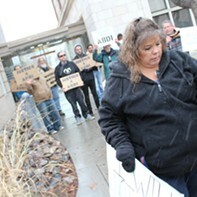 Utah Juvenile Defenders are co-representing Mohamed with the Salt Lake Legal Defenders Association. Its executive director Pam Vickrey writes in an email, "the release of our client's juvenile record without any context portrayed him as a dangerous individual with a violent past, perhaps swaying public opinion that the police may have been justified in using deadly force." She blames ambiguities in a Utah statute governing juvenile records for allowing the AOC to release them without judicial review. Worse was to follow in August, when Gill made a verbal-only "detailed and moment-by-moment summary of the video ... on live television from the perspective of the prosecutor's office," at the same time announcing charges against Mohamed for robbery, Vickrey adds. She and co-counsel decided not to ask the judge to close the hearing because the records and Gill's breakdown of the events was already public. Since Mohamed's shooting, Vickrey says, "we have also seen a tremendous upswing in the media's interest in juvenile cases." In the past eight months, she continues, her office has seen more media requests to the courts for access to juvenile cases than in her 17-year career. "This type of attention on certain kids and their families is contrary to the purpose of juvenile court," which seeks to hold juveniles accountable, protect the public and support rehabilitation. The last, she adds, is highly challenging when the juvenile is under intense media scrutiny.